RALEIGH — Campbell Law Dean J. Rich Leonard has announced that McGuire Woods Attorneys is financially sponsoring a team of Campbell Law student advocates competing at the 26th annual William C. Vis International Commercial Arbitration Moot on March 31- April 6 in Hong Kong, China. The team includes third-year students Taylor Langley and Sarah Skinner and second-year students Lindsey Reedy, Joseph Gorga, and Michael Chaney. The team is coached by Adjunct Professor Andy Penry, a partner at Penry Reimann, PLC and Wake County Senior Resident Superior Court Judge Paul Ridgeway ’86. 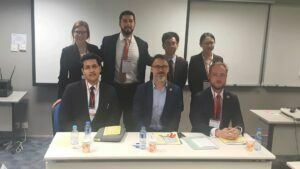 Campbell Law’s Vis Moot team has just completed the second of four general rounds. 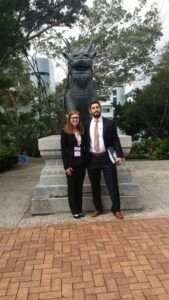 Following yesterday’s strong performance by 3Ls Michael Chaney and Taylor Langley, 2Ls Matt Gorga and Lindsey Reedy Heck continued to pave the way for Campbell Law’s advancement to the elimination rounds. Heck and Gorga argued for Claimant Phar Lap Allevamento against students from South China Normal University. Heck covered the substantive issues concerning the possibility of price adaptation when the parties agreed to a sales contract containing a hardship clause and a DDP provision. Gorga argued the procedural issues concerning whether the Tribunal has the authority to adapt the contract when the arbitration clause is itself silent as to the choice of law in the arbitration clause. The arbitrators/judges for this round noted that it was a “very, very good round.” Both Gorga and Heck were praised for their “nice conversational tone.” Particularly, Gorga was complimented for his ability to “put really difficult things in a simple way.” Commenting on Heck, the arbitrators stated “you had our attention.” For this round, the arbitrators hailed from India, the United States, and the Russian Federation. Campbell Law’s march to the elimination rounds continues on Wednesday when Chaney and Langley will argue for the Respondent Black Beauty Equestrian against students from Amity Law School, Delhi. 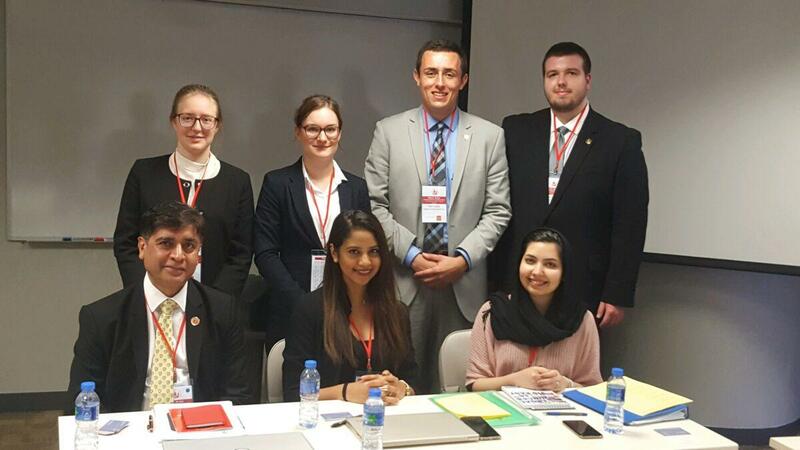 Our 2L team will argue for the last time in this competition on Thursday at 2:30 p.m. when they will face the University of Bucharest. 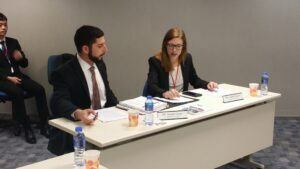 Students who argue in the Vis Moot elimination rounds are precluded from competing in the Vis Moot again so, their talent will be preserved for next year. The Campbell Law 3L team will learn whether they advance at 7 p.m. Thursday. The Vis Moot was created as a clinical tool for training law students in crucial aspects of the procedure: research, drafting and advocacy. International business community’s marked preference for arbitration as the means for resolving trans-border commercial disputes, is the exact skill the Vis Moot chooses to enhance. Law students participate in two separate but equally important phases: the research and writing of memoranda for both claimant and respondent, and oral arguments based upon the memoranda. Both phases are judged by panels of international arbitration experts. The Moot problem always involves a contract dispute arising out of a transaction relating to the sale and purchase of goods under the United Nations Convention on Contracts for the International Sale of Goods (CISG). McGuireWoods is a full-service firm providing legal and public affairs solutions to corporate, individual and nonprofit clients worldwide for more than 200 years collectively. The law firm, over its 185-year history, has earned the loyalty of  its many longstanding clients with deep understanding of their businesses, and broad skills in corporate transactions, high-stakes disputes, and complex regulatory and compliance matters. It’s wholly-owned affiliate, McGuireWoods Consulting, now in its 21st year, provides a unique — and uniquely potent — combination of state and federal government relations prowess, buttressed by world-class infrastructure, economic development, and advocacy expertise. Working together from 26 offices in the U.S., Europe and Asia, McGuireWoods and McGuireWoods Consulting share a dedication to diverse perspectives, impeccable service, and innovative delivery of practical, business-minded solutions. Terrence M. Bagley is a 1982 graduate of Campbell Law and served as chairman of the law school’s Board of Visitors from 2012 to 2018. He is former deputy managing partner of  McGuireWoods and former chairman of the firm’s litigation department. His practice focuses on products liability, toxic tort, and commercial litigation. He has extensive experience in defending clients in automotive, power products, and asbestos litigation. He has litigated throughout the United States and has tried products cases to verdict in state and federal courts. He has also argued cases in state and federal courts of appeal. He has served as national and regional counsel in mass tort cases, including cases pending before various multidistrict litigation (MDL) courts.